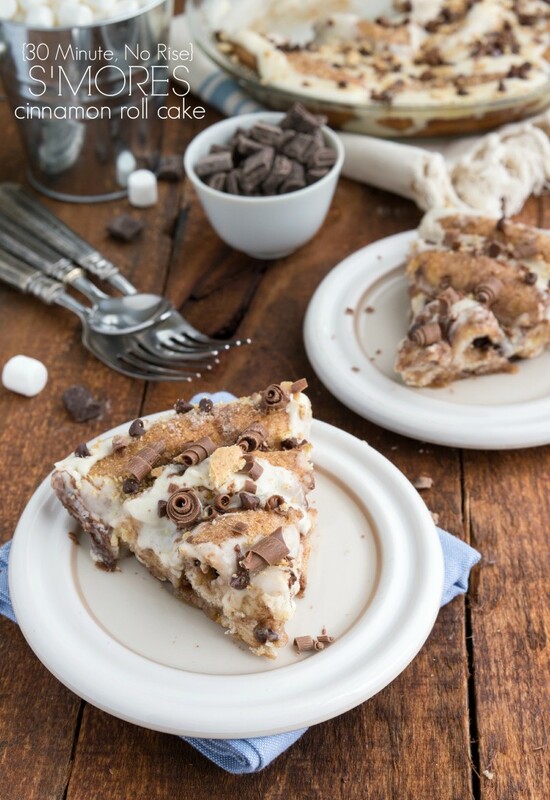 A 30-minute, no rising required S’mores cinnamon roll cake filled with miniature marshmallows, miniature chocolate chips, and graham cracker crumbs. This cake is covered in a marshmallow frosting that will melt in your mouth! Another day of S’mores week! 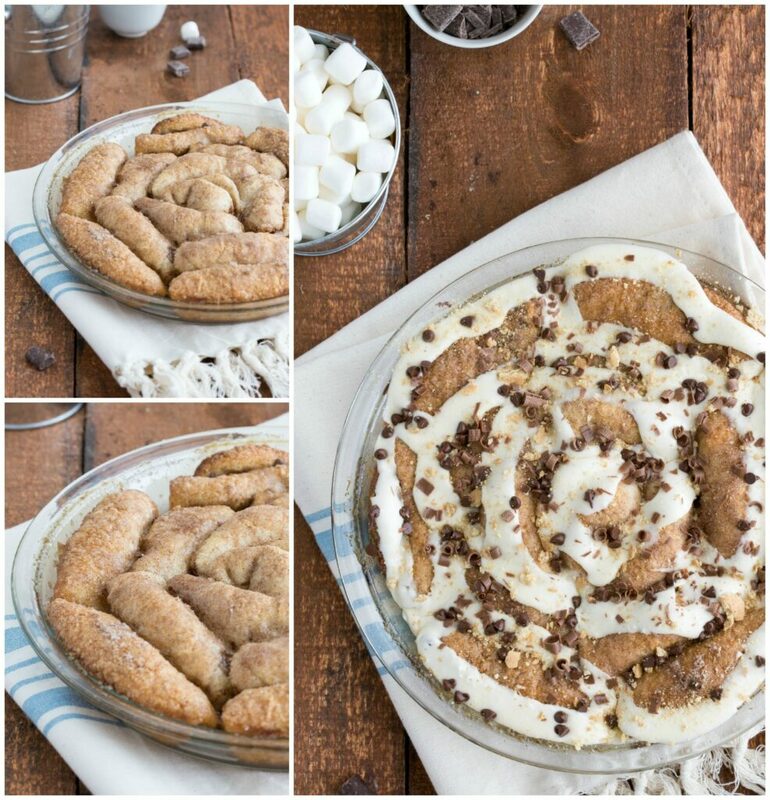 And today we’re kicking it off with a simple, thirty-minute, no yeast s’mores cinnamon roll cake. I won’t even hide the fact that I’m completely obsessed with S’mores. But then again, I suppose that was pretty obvious. I am participating in a entire week-long celebration of all things S’mores after-all. I was going to do plain S’mores cinnamon rolls for the post today, but decided instead to make a quicker version in a cake form. The methods are the same, but the fillings and flavorings are heavily adapted from my 30-minute cinnamon roll cake. 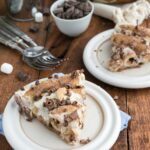 This S’mores cinnamon roll cake was made in a cake pan for all of you out there that don’t have a cast-iron skillet. However, if you do have a cast iron skillet, these cinnamon roll cakes are divine in one! You start with buttermilk biscuits dunked in some melted butter and then a cinnamon-sugar mix. The s’mores part comes in after that. You layer on some crushed graham cracker crumbs, miniature chocolate chips, and miniature marshmallows on top before rolling them up. I cut the miniature marshmallows in half before putting them in the biscuit to make these easier to roll-up and to spread the marshmallow goodness all over the biscuit. And let me tell you – these are so gooey and bursting with marshmallow flavor. The really cool part about putting the marshmallows inside is the biscuit and baking it is it dissolves leaving behind the most amazing sugared flavor. And a lot of stickiness too. But to make sure you are still getting plenty of marshmallow flavor, I also added in some marshmallow fluff to the icing that coats this cake. Plenty of marshmallows for this cinnamon roll cake! And then the garnishes on top of the iced cake? Totally optional, but way fun. If you put miniature chocolate chips on top of the warm icing, they will melt in a little bit leaving a sweet melted chocolate flavor to each bite of this delicious cake. And thirty minutes? I mean how can you say no?! That’s even quicker than starting a fire and roasting marshmallows! Preheat the oven to 350 degrees F. Spray a cake pan with nonstick spray and set aside. Remove the biscuits from the packages. Using a rolling pin, roll each of the biscuits very flat and thin. Stir together the white sugar and cinnamon in a small bowl. Dip each biscuit in the melted butter, shake off the excess and then dip the biscuit in the cinnamon sugar mixture making sure to cover both sides. Shake off the excess. Slice the marshmallows in half. Using the picture in the post as a guide, place a small handful of graham cracker crumbs, miniature marshmallows, and miniature chocolate chips on one side of each biscuit. Roll up each biscuit and place the rolled up biscuit on the outside of the cake pan in a circle fashion spiraling towards the inside of the pan. Meanwhile, prepare the frosting by beating together the powdered sugar, butter, and vanilla extract. Beat in the marshmallow fluff. Slowly add in the heavy cream until desired consistency is reached. Remove the cake and let cool for about 5-7 minutes before frosting. Pipe the marshmallow frosting over the cake and cut into slices to serve. 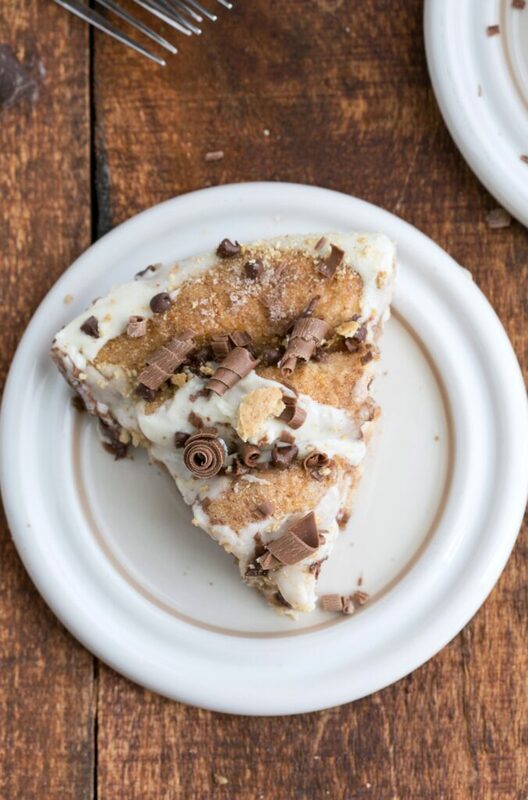 Top the cake with any leftover miniature marshmallows, miniature chocolate chips, and graham cracker crumbs that weren't used to fill up the biscuits. If desired, unwrap a room temperature chocolate bar, and “peel” it from top to bottom directly over the cake. Slice into large pieces and enjoy while warm! OH MY GOSH! YOUR NEW DESIGN! It is SO PRETTY GIRLFRIEND – I am TOTALLY JEALOUS 😉 Haha! But, congrats! What a delicious smore cake, Chelsea! I love that it doesn’t require yeast and instead uses biscuits. I wish I could dive into this right now for breakfast! 🙂 And I love your new site design! Very eye catching and clean! This is incredible looking Chelsea! Pinned. And I love the new look of the blog. Way to go! Thanks so much Melanie! 🙂 Hope you have a great day as well! Oh my goodness, Chelsea. You make the BEST cinnamon roll cakes :). This one may be my favorite post of yours… I am just dying over all this wonderfulness. Also, cinnamon roll week? Yes, please! Oh my goodness! What a completely decadent cinnamon roll! I almost passed out BEFORE I knew there was all that smores goodness rolled inside! Pinned! So not only did you combine two of the best things in the universe, your new blog design looks AMAZING! 🙂 I’m really loving this cinnamon roll cake, Chelsea. I mean, there isn’t much more I can say than that. I LOVE it. 🙂 Pinning! And omg, I just noticed the little whisk that shows up on the links at the top! So cute!! This looks faaaaaabulous Chelsea!! And I love your new design! So fun! first of all, it is just gorgeous, but I love that is is so simple to put together! I was searching for cinnamon roll recipes last night! I’ve just been craving them like crazy. Gotta make this one! Can’t. stop. drooling. LOVE this! And I will never turn down anything s’mores related! This is gorgeous, and now that I’ve seen it with those pretty curls I would never be satisfied with it any other way 🙂 Love the design too! 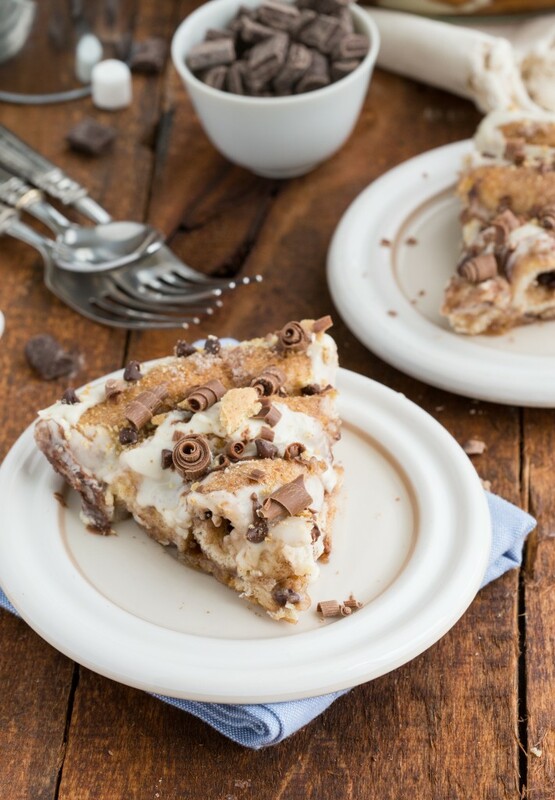 And this cinnamon roll cake – WOW. I am on a smores kick (why are marshmallows plus chocolate SO finger licking good?) and cinnamon rolls are my weakest point (and I'm proud of it:)) Pinned! This is just down right awesome! Absolutely loving this!! 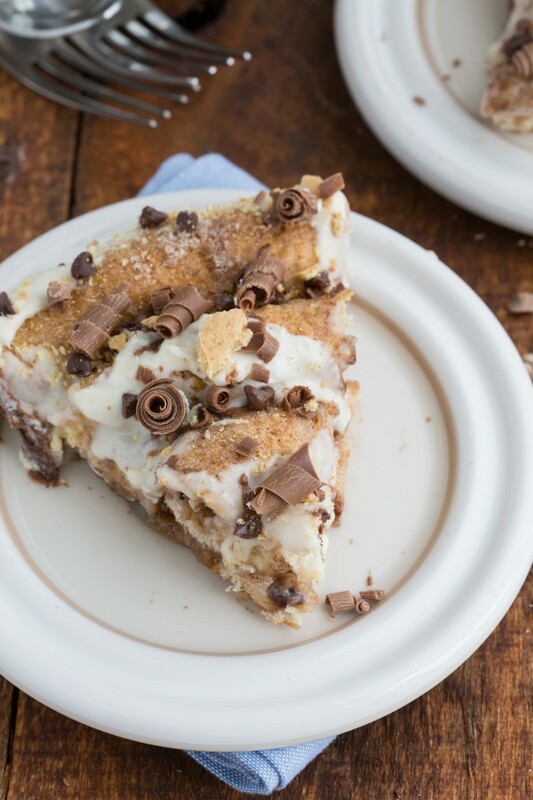 I love that it only takes 30 mins with no rising and of course, you just can’t beat a S’more! I HAVE to make this ASAP!! This cake is gorgeous! 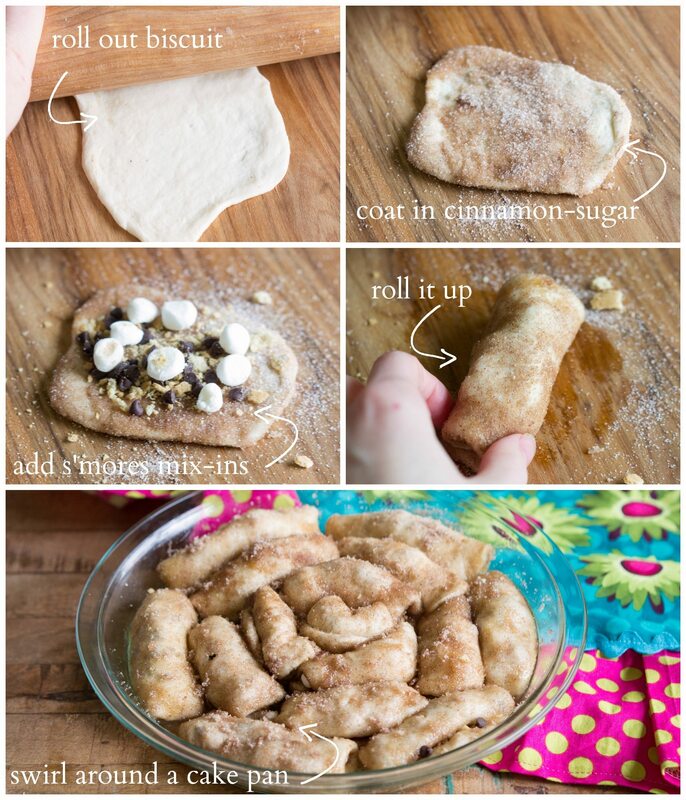 Stuffing the rolls with s’mores goodies is genius and sounds delicious! Haha and heck yes, I would love a cinnamon roll week 🙂 I love your new logo and design 🙂 So so pretty! Ok. I may have just had a mild heart attack after seeing all those pictures of this cinnamon roll cake. It’s…. perfect. Like seriously Chelsea, you’ve been coming up with some amazing sounding recipes lately!!! Your site looks really pretty, Chelsea!! I love the light pink. Woah! LOVE this! I can’t believe how easy this cake is! Pinned! This looks heavenly!! Love how easy this looks to make too! Your sister in law Alli just introduced me to your blog… I am starving now!! I don’t even know where to begin everything looks so magical. I can’t wait to try some recipes. INSAAAAAANE! omigosh. Those chocolate curls are so pretty and just this entire concept is unbelievable-so sooo good! Love the step-by-step pics and the beautiful chocolate shavings. Perfection! I am making this for one of my coworkers B-day tomorrow, looks so good. 2 quick questions. 1. If I bake it tonight how should I store and reheat for tomorrow? 2. Would it work if I made it up tonight and baked it tomorrow? Thanks can’t wait to try this!! This, unfortunately, doesn’t store very well. It’s best eaten right out of the oven. You can make it, cover it, and bake it at a later time though. Hope you love it!